Sounded intriguing - and turned out to be inspirational. 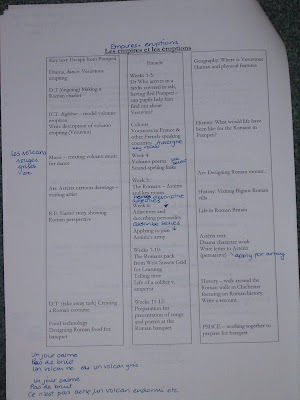 Stunning starts and fabulous finishes – each project (lasting a term) had a really special opening activity or experiences – and the kids were hooked, inspired, gobsmacked, the lot for the whole topic. Equally, the end of the project was celebrated and had a ‘fabulous finish’ – bookending the experience. - Voyage dans l’inconnu began with the pupils returning from Christmas to discover a crater in the school grounds, containing bits of metal and an advert for ‘jeunes astronautes’ in French, calling for fit young people. - For Les empires et les eruptions, Dr Who arrived in the school hall in his TARDIS, covered in volcanic ash having escaped Pompeii. Can the pupils find out more about what happened to Vesuvius and volcanoes in general – are there any in France? So – what sort of things did they do? Each school did a baseline assessment of skills, attitudes and integration of MFL into school at the start and from this wrote individualised targets for the school. 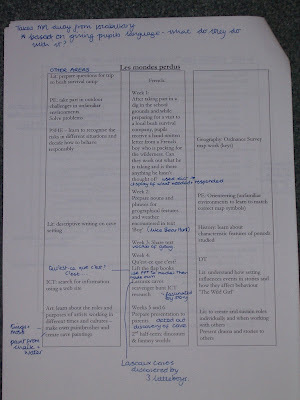 Then each school looked at existing curriculum and, using the targets as a starting point, created a topic or module lasting 6 or 12 weeks that enmeshed all the subjects including MFL (in most cases French) . increased parent - child conversation about school work! attendance improved as pupils didn't want to miss things. I love this approach - I'm all for creative curriculum planning and in the light of recent posts about the preponderance of literacy and numeracy, it's heartening to see the use of other areas of the curriculum enhancing these skills.